In order to appreciate the complexities of a lake system, it is important to understand that lakes are dynamic systems with chemical, biological and physical characteristics that are extremely variable. In terms of their chemistry, lakes vary in their nutrients, pollutants or even ion concentration. Lakes vary biologically in terms of the amount and type of organisms (algae, plankton, and fish), growth rates, etc. Finally, a lake varies based on physical properties such as light levels, temperature, water currents, sediment type, etc. Lakes also vary based on factors such as day versus night, seasonality, time scale, etc. Ask any Loon Laker about the state of our lake and he/she may be able to tell you much about the history and changes the lake has seen over the last several decades. Lakes change; lakes age. Humans play no small role in the impact of our NYS lakes. 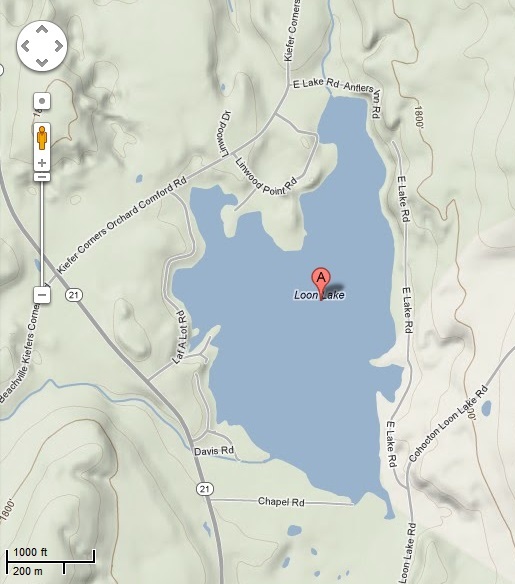 But how does a lake become impacted when Loon Lake is such a small waterbody? The answer lies in simple gravity and what lies at the bottom. 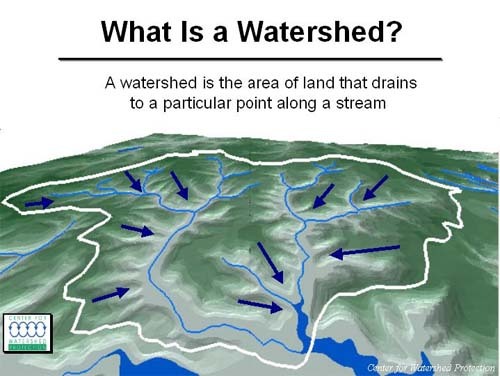 All the land and water area that drain toward a particular waterbody is considered a watershed. Think of it like a funnel; anything liquid that goes into the funnel, ends up going down the spigot. But, what about solid material- say a heavy metal pollutant? The pollutant may indeed stick to the sides of the funnel but what happens when it rains? Water is the universal solvent and NYS rainwater at a pH of ~5.2 or less will dissolve many pollutants and carry it in solution to a final destination: the end of the funnel. In this case, we are talking about Look Lake. We can think of many pollutants that are persistent in the watershed and end up in our lakes; this could be anything from road salt to sediments to manures. The concern arises when too much of a pollutant ends up in our system which is too small to buffer the added concentrations. One of the most important drivers of a lake is light. The ability of a lake to absorb sunlight determines the temperature and photosynthesis capacity of the primary producers (think algae, seaweed, etc.) in the system. Remember that photosynthesis provides the energy for much of the food web within a lake system. Additionally, through the photosynthetic process, primary producers add dissolved oxygen to a system. Since light is vital to the photosynthetic process, it is important to determine how far light will penetrate a water column. Variables that affect light’s ability to penetrate are dissolved substances such as organic nutrients and suspended materials such as eroded soil from the watershed, algae, and detritus. People who study lakes (Limnologists) use a Secchi disk to determine the transparency of water. 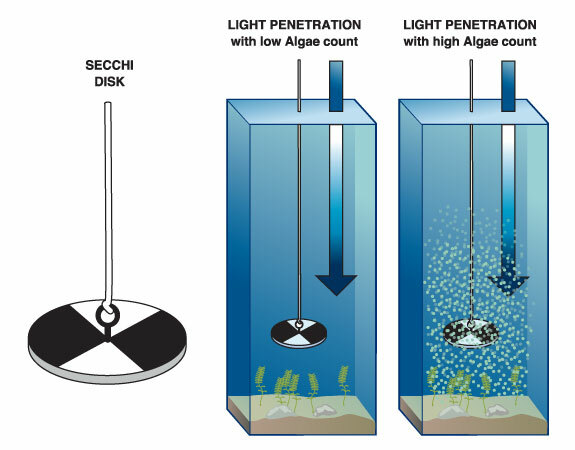 The greater the Secchi disk reading, the more transparent the water and the less dissolved and suspended particulate matter. Loon Lake is considered a temperate, dimictic lake that undergoes thermal stratification twice per year, with the most significant temperature differences occurring in the summer. Based on the special properties of water, a lake will stratify based on the density differences of water where colder water is denser than warmer water. The upper layer of the water column, known as the epilimnion, contains warmer temperatures and remains mixed via wind while light impinging on its surface heats, and therefore increases, the temperature in that layer. The metalimnion is the transitional layer of cooler water above the hypolimnion, the deeper, denser, colder region of the water, and includes the thermocline which is the region of greatest temperature change between the epilimnion and hypolimnion. The hypolimnion is too deep to be affected by wind and does not mix readily. Figure 4. 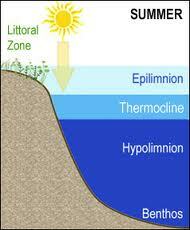 The three layers of a lake that occur during a typical summer thermal stratification based on density differences. Photo: RMB Environmental Laboratories, Inc.
Photosynthesis only occurs where light can penetrate into the water column, which is called the photic zone. Oxygen concentrations then in the photic zone (epilimnion primarily) will be high because of both photosynthesis (which adds oxygen as a byproduct) and diffusion of oxygen from the atmosphere. In Loon Lake, the hypolimnion (colder, denser bottom layer) uses up all its dissolved oxygen through metabolic process such as respiration and decomposition by organisms. Because the deeper, non-mixing hypolimnion is cut off from the warmer, lighter, mixing epilimnion, no oxygen exchange can occur. Therefore, the hypolimnion may rapidly become anoxic (without oxygen). Remember that a lake will stratify based on density difference that occur during the summer and winter months. Anoxic conditions in the hypolimnion often cause a release of phosphorus from the sediments at the sediment-water interface on the lake bottom. When the lake mixes in the spring or fall, the newly added phosphorus and ammonium from anaerobic respiration and decomposition facilitates the unimpeded growth of algae. This is addition of phosphorus back into the water column causes deleterious effects such as algal blooms which causes die offs of organisms or thick algae and seaweed growths which causes nuisance blooms, odor problems, etc.. Therefore, to reduce impact on a lake, it is important to manage what enters a lake via the watershed. Reference: WOW. 2004. Water on the Web – Monitoring Minnesota Lakes on the Internet and Training Water Science Technicians for the Future – A National On-line Curriculum using Advanced Technologies and Real-Time Data.(http://WaterOntheWeb.org). University of Minnesota-Duluth, Duluth, MN 55812.